This trusted pre and postmarital manual now has NEW additions! How does a couple know if God has called them to marriage? This manual, provocative by nature, is written to help couples build their foundation and grow their future marriage. Steve and Mary Prokopchak believe premarital counseling must be a time of searching and revealing hearts, sharing deep values and being honest about themselves and their future. They have developed the contents of this manual over the past 25 years by working with hundreds of married and engaged couples. 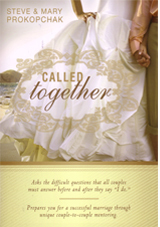 Called Together is a unique “couple-to-couple” workbook to help prepare for a successful marriage union and is designed to be used by counselor mentors leading pre- and postmarital sessions with engaged couples. It provides everything needed to begin a great marriage: in-depth biblical counseling, worksheets to help share feelings, communication, financial planning, sexual relations, post-marriage checkups, and wedding tips. About Me: Taking an in-depth look at me. About Us: Being honest about us. Let’s Talk: What are the communication obstacles? Finances: Is your budget realistic? What are your financial values? Sexual Relations: Maintaining God’s gift within marriage. Ceremony Planning: Putting it all together to become one. Nine Months: What life-long patterns are you establishing? This manual includes special sections to help tailor-make the material to the specific needs of each couple: When Christians Remarry, Intercultural and Interracial Marriage, and When Seniors Remarry. Also includes a Counselor’s Guide. FREE Counselor training now available!